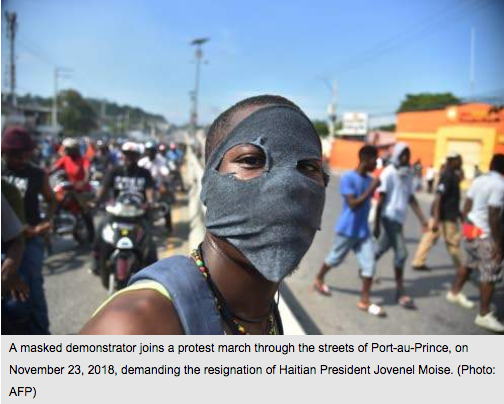 PORT-AU-PRINCE, Haiti (CMC) — Haiti was showing signs of returning to a level of normality yesterday after residents dismissed calls by the Opposition parties for two days of street protest to force President Jovenel Moise out of office. After a week of being paralysed by acts of violence and demonstrations, schools reopened on Monday and businesses in the capital Port-au-Prince, as well as in the provisional cities, were reopening. Officials said public transport and taxis were on the streets and several trade union leaders have taken to the airwaves denouncing the two-day protest action called for by the Democratic and Popular Movement, an Opposition grouping of 20 political parties. Police have maintained a strong presence in the capital, and Interior Minister Jean-Marie Reynaldo Brunet said the Government had outlined new measures that would allow members of the population to go freely about their activities. Brunet condemned the acts of violence during the street protest last week, adding that the street demonstrations had taken the form of urban guerrilla warfare. He warned that any destabilising action against the backdrop of “peaceful demonstrations” will not be tolerated, and that the security agencies were instructed by the prime minister to fully assume their responsibilities. Brunet said all citizens, especially those in Port-au-Prince, Les Cayes and Cap-Haitien who were seriously affected by the demonstrations and violence, should resume their normal activities. Meanwhile, Prime Minister Jean-Henry Céant, on Monday launched a programme aimed at creating an estimated 50,000 temporary jobs until the end of the year. “We have decided to offer the people an alternative; we are determined to remove the people from where they are. The goal is to put 50,000 people to work before the end of the year for the purpose to clean up the country and allow everyone to eat,” Céant said, adding that “it was only a beginning (and) the best is yet to come”. The authorities handed out shovels and brooms to mainly young people in several neighbourhoods under the two-week sanitation campaign. The Opposition parties have been staging street demonstrations in support of their calls for President Moise to step down, after accusing him of not investigating allegations of corruption in the previous Government over PetroCaribe, an oil alliance of many Caribbean states with Venezuela to purchase oil on conditions of preferential payment. But in a radio and television broadcast last week, Moise dismissed calls for his resignation. “It is within the framework of the democracy that the Haitian people elected me president in elections, free and honest, as they wish the constitution. “During the five years of my presidency, no one, I mean nobody, whatever the pretext, cannot threaten the interests of the country or put the nation in danger. The strength of any democracy, it is the respect of the law,” Moise said.